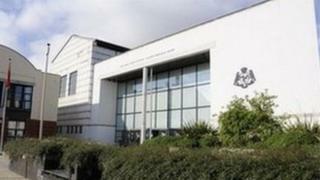 A trial on the Isle of Man had to be abandoned after photographs of jurors and a prosecutor were taken in court.The jury was discharged after the Deemster presiding over the case in Douglas, which was in its closing stages, was told about the photographs.A police investigation into possible contempt of court revealed that, unlike in England, there is no legal provision prohibiting unauthorised recordings.A public consultation into a Manx bill to close the loophole is under way.Deemster Alistair Montgomerie's office declined to reveal any details about the abandoned case. A spokesman said this was because a retrial will take place later this year, and new jurors cannot know about the original trial. An Attorney General's Office spokesman said: "The Deemster directed the police to conduct an inquiry into possible contempt of court or an offence of attempting to pervert the course of justice. "It was then discovered that, unlike England, which has legislation prohibiting photography in courts without the leave of the court, nothing in this jurisdiction, other than perhaps the inherent power of the court to regulate its own proceedings, precludes such photographs from being taken. "The Contempt of Court Bill 2018 aims to address that issue and other contempt of court issues by establishing offences and penalties.Amongst the clauses would see the maximum penalty for contempt of court increased to The closing date for comments on the bill is 28 September. » Contempt of court - what does it mean?